This 2012 page briefly summarizes my modeling of fractal tetrahedrons, as might apply to electromagnetic coils. 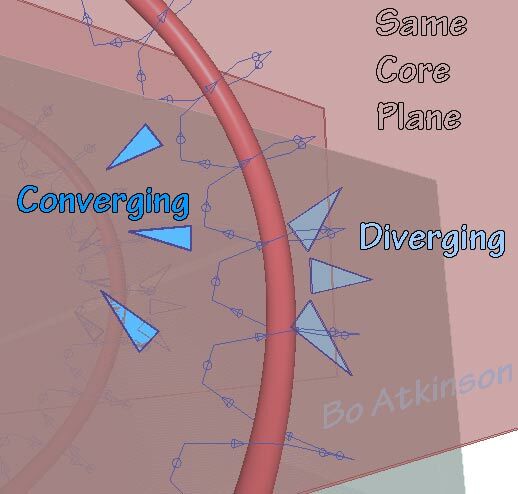 For many years now, i have 3d modeled many arrangements, in order to contemplate the reactive fields. Fractal geometry could align the inductive field differently than traditional electro-magnetics. When arranged into complex arrays, the fractal fields might offer interesting effects. I'm glad to share these concepts with many experimenters trying new, experimental concepts. The above scaffolding eventually lead me to the 8X8X8 arrangement, in next image below. (First web posting is here). After studying the 8X8X8 arrangement, i found that the octahedral aspect ratio could be modified to other 3d aspect ratios. It might be interesting to reverse engineer the scaffolding on these variations. Circuit application follow, further below. The following image has the scaffolding, (larger tetrahedron) shrunk internally, (to show relationships)... Many perspective-angles (or focal lengths) are provided to explore the seeming changes of geometry. Yet the 3d geometry always remains constant in this poster. The term 'equilibrium' was made popular by Bucky Fuller's Synergetics. The octahedron, so it seems, is an ample and earlier term. Yet emphasizing the term 'equilibrium' may have been absent, before Synergetics. (Or was it simply the lack of powerful geometry software). Experimental construction reports should be added in time. Although my procrastination record keeps me distracted with many other things, (like making a living). Geometric modeling procedures are presented first to explore and demonstrate natural 3d layouts. Ultimately, the intent is to wire-build, in real life, with fractal-coil circuits. To experiment with these fractal circuits-- To test effects as resonators or radiators of electromagnetic energy. Next is an example of circuiting one tetrahedron with multiple turns. These multiple turns are an example of increasing the induction of each coil. This approach to en circuit a tetrahedron derived from my discovery that a tetrahedron is formed directly by the formula of the helix: When the helix object is facetted with exactly 9 straight segments. (See relevant page on this website). What if the octahedral unit is arranged into a fractal matrix of many modules? These fractal matrices or space-packings can be fit into a wealth of diverse networks. At this point, the concept is introduced only as inspiration. Inspired thoughts, in this case demands a 3d-welder-printer, to automate construction. How to build it and what could a fractal-coil do for us? Let us find out! I learned about the vector equilibrium from the book "synergetics" by Buckminster Fuller. For better or worse, the term "vector equilibrium" was taken over by the polyhedron shape of the octahedron, as two words, with one meaning. Therefore, the English language needs a special word to signify "equal in all directions" in referring to any sort of example. The dandelion is an example of parts all pointing outwardly. We currently have no adjective of adverb or noun which clearly signifies this meaning. 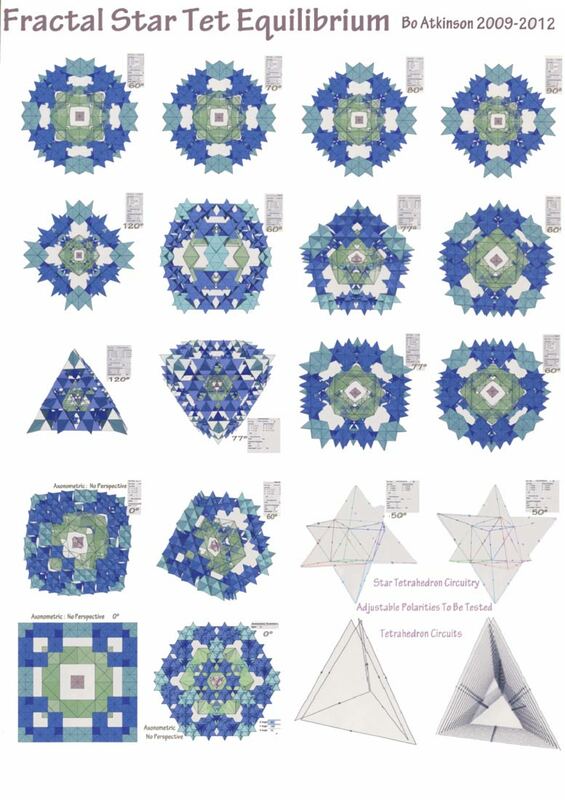 "The stellated octahedron is the only stellation of the octahedron. It was depicted by Leonardo da Vinci in Pacioli's book 'De Divina Proportione' in 1509. A hundred years later was named 'Stella octangula' by Johannes Kepler." My earliest tetrahedron modeling with a Synergetics forum online. My earliest work with 3d modeling software. My exploration of electric and magnetic field relationships, through geometry. My experiments with feeble currents and coil geometries. Conceptual artist is repressed, for modeling coil art? Continuation of my printed coil "thought experiments", March 2013, modeling for a transversely wound and folded coil. Envisaging Transverse Force Fields: Laminated, parallel coils are considered on this linked page. Geometric speculation: Relationship of poloidal structure to the tetrahedron. geometric speculation: poloidal coil structure. biaxial potential for habitable buildings.